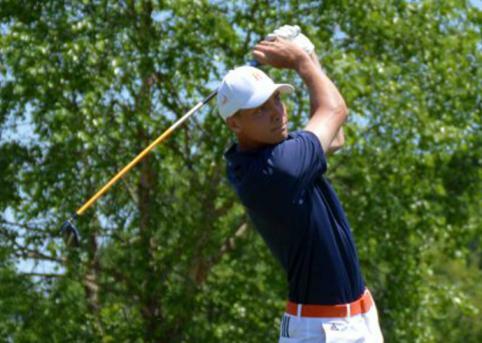 The Hope College men’s golf team finished 23rd at the 41-team NCAA Division III Championships on Wednesday in Greensboro, N.C. The MIAA champion Flying Dutchmen shot a second-round score of 302 on the Grandover Resort’s East Course for a 36-hole total of 614. They rose five spots from their first-round position but missed the cut for the final two rounds by nine strokes. Sophomore Winton Munch of Traverse City, Michigan (Central HS), fired a 1-over-par 73 during the second round and led Hope with a total of 150 that tied him for 45th place. Senior Collin Breit of Muskegon, Michigan (Western Michigan Christian HS), placed one stroke behind Munch in a tie for 57th. He had a second-round 75. Senior Ben Lewis of Grand Haven, Michigan (Grand Haven HS), shot a team-low 72 on Wednesday to tie for 105th and finish four strokes behind Munch. Senior Evan Telzerow of Grand Rapids, Michigan (Forest Hills Northern HS), carded a second-round 82 to tie for 114th place and place two strokes behind Lewis. Senior Ben Lanting of Littleton, Colorado (Front Range Christian HS), had a 79 Wednesday and finished 12 strokes behind Telzerow. Hope College women’s golf coach Greg Stafford said he could not have been prouder of his players this week at their first NCAA Division III Championships appearance. Hope College tennis player Carli Capestany has been chosen to the 2014-15 Capital One Academic All-District ® Women’s At-Large Teams, selected by the College Sports Information Directors of America. Hope College diver Sarah Sheridan has been chosen to the 2014-15 Capital One Academic All-District ® Women’s At-Large Teams, selected by the College Sports Information Directors of America.